When I ran on Tuesday evening at Run Walk for Life, the sky was definitely lighter for longer… and a lot softer too. That means I should be able to start running further in the evenings soon! I’ve been going 6km in the evenings, and only did 7km the week before I ran a 10km as training… but soon I’ll be able to run that distance every time. It’s just too dark right now. So I haven’t blogged about my progress in a while, and for consistency sake, I’ll update the same way I did last month! ran a total of 74,3km! Woohoo!! Got through that 70km barrier! 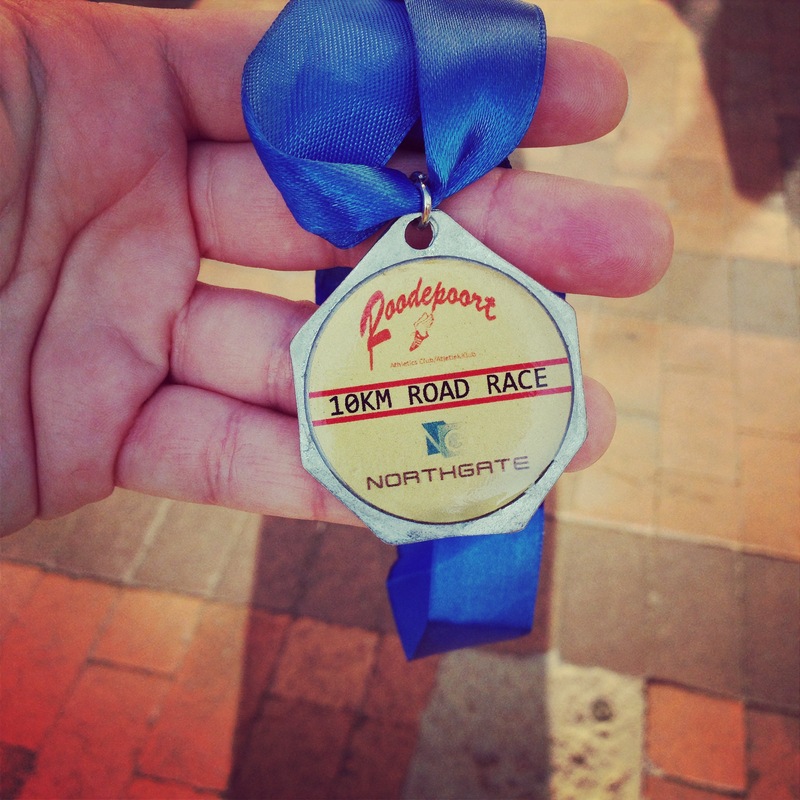 ran the Northgate 10km race… and finished it in 65min… almost 5 minutes faster than my first 10km! ran at my fastest pace… 6:34/km! I’m still using Runkeeper to track my stats over the month, but now I’ve also tried out Strava. Although I like the stats over similar courses that Strava refers to, I much prefer Runkeeper’s stats and summaries. In BIG news though, Lance and the boys got me a running watch for my birthday!! Woot! So now I’m running with my TomTom Runner… it’s a gorgeous pink one… and I’ve connected that to Runkeeper and Strava too for my monthly stats 😉 if you want to know more about my experiences with the apps, let me know, and I’ll blog a comparison… and a review of my gorgeous watch! Sadly though, I seem to have hurt myself in the process. I must’ve stretched strangely at that walking clinic the day before the race, and I hurt my right ankle and my left foot. Running seems to be ok, but once I stop I’m sore again. I gave running a break for a week after the race because I was busy, and I had to get to Zimbabwe for the wedding… but during my 6km run last night, my ankle problem flared up again. So tomorrow I’m going to see a physio. I’m determined to run more races, and I’d rather get this fixed than let it get worse. BTW, this physio I’ve seen for my neck and now this, seems to be fab. She was a referral from a photography friend who is also a physio… and she specialises in runners. She fixed my neck quickly, so hopefully this isn’t serious and she sorts me out chop chop. I’ve got to plan when I’m running my first 15km now!! Exhausting reading that list !!! Well done my girl so proud of you ! !